Squashes are native to America, eaten by Native Americans as winter staple along with dried beans and corn. Acorn has a green skin orange flesh. Some varieties are stripped, white, or multicolored. Most common of squashes. 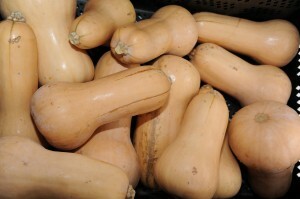 Butternut is tanned with skin yellow flesh. Good in soups, roasted and easy to grill. Buttercup is hat shaped heavy, dense flesh. Baked, grilled and great soup. 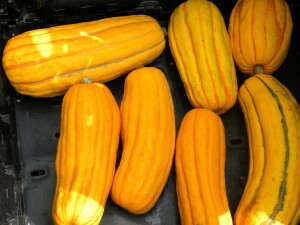 Delicata, also know as sweet potato squash, long green stripes on yellow with sweet orange flesh. Hubbard, dinosaur eggs, have a blue gray skin with a orange flesh. Usually large. Great for soups, pies and roasting. Kabocha is the Japanese variety of Buttercup. Spaghetti squash is the most unusual of all squash. Yellow, tan or orange in skin color. Orange having the higher carotene value. Stringy flesh usually served like pasta. Pumpkin easily recognisable by their orange skin and flesh used for pies, soups and casseroles, chunked for roasting. Winter squash have hard, thick skins and will last stored in a cool dry place. One pound squash equals two cups mashed. To cook you have to slice the squash in half. Try placing the whole squash in a microwave oven for 20 second intervals. Do this until the outer rind is soft enough to carefully cut in half with a large knife. Remove seeds and place halves cut side down. Remove fibers and seeds; then bake, steam, microwave, grill or boil. Baking method: Bake in preheated 350 oven for about 45 minutes. Turn cut side up and loosen pulp add filling. Cook additional 15 minutes. Microwave alternative: Cook squash halves face up on high at 15 minute intervals. 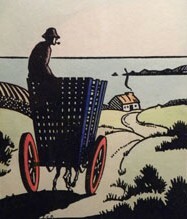 Check tenderness with a fork. Cook until tender. Winter squash can be sweet or savory. Stuffed any cooked winter squash with butter and herbs, meat or vegetables, a cream sauce, cheese sauce, cranberries, honey, maple syrup, and nuts, marinara sauce or stewed fruit. Squash have been roasted, grilled, used in pies, casseroles, chunked or cubed for stews or pureed for soups.